Chocolate tea is a nickname given to compressed Wuyi Yancha 武夷岩茶 in the 1990s when they were popular amongst tea drinkers. This tea is compressed in the shape of a chocolate bar with segmented ribs. 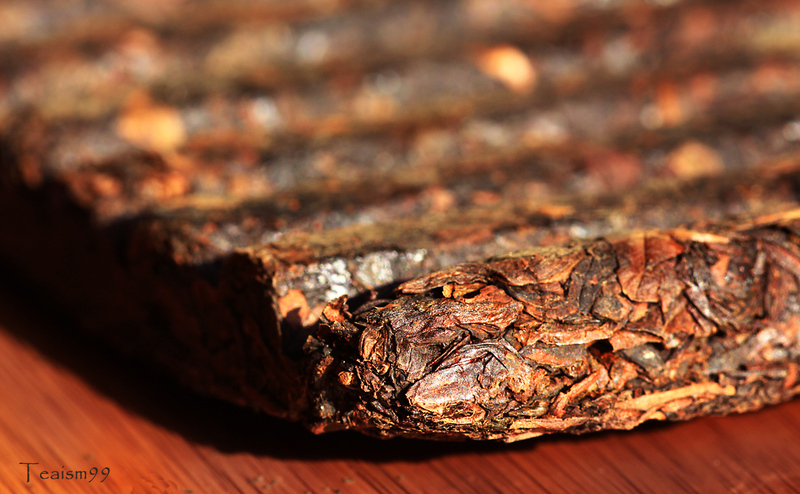 Usually a segment of the tea is broken along the ridge of the bar, just like chocolate and brewed in Yixing teapot. Sometimes, a chunck of the tea is plopped into a kettle of boiling water; the casual ritual of drinking and brewing would just continue the whole day. 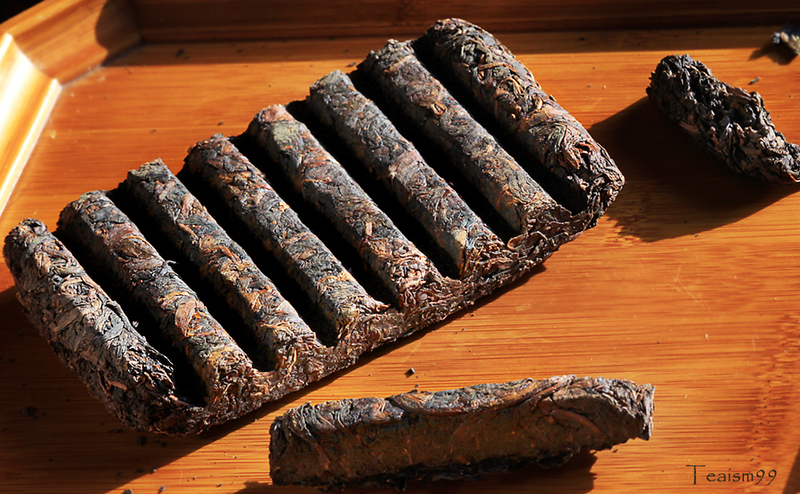 This tea compression style concept is very interesting as the tea leaves consist of Yancha 岩茶, but made and aged in Puer style in the shape of chocolate bar. Delightful concept, isn’t it? Today, I will brew a piece of this tea to experience its taste. It is a 1990s piece made from Shui Xian Yancha 水仙 岩茶, compressed in chocolate bar shape. 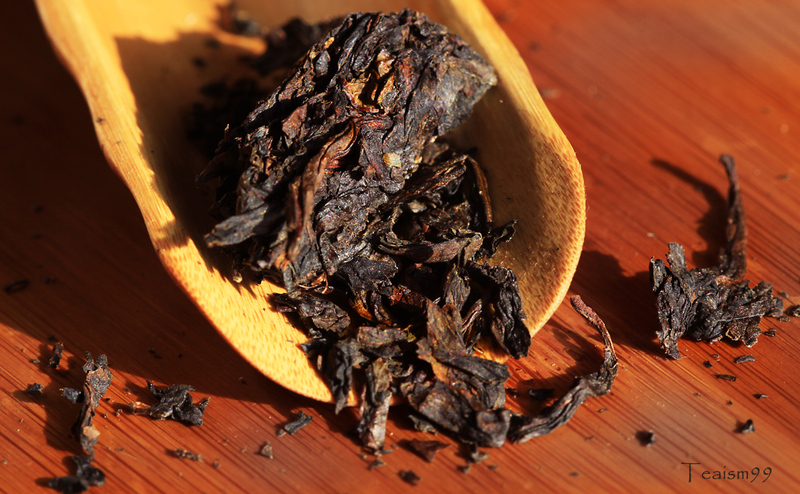 A segment of the tea is broken and individual tea leaves are carefully removed. Normally, I like to refresh tea before brewing so I will do the same for this tea. 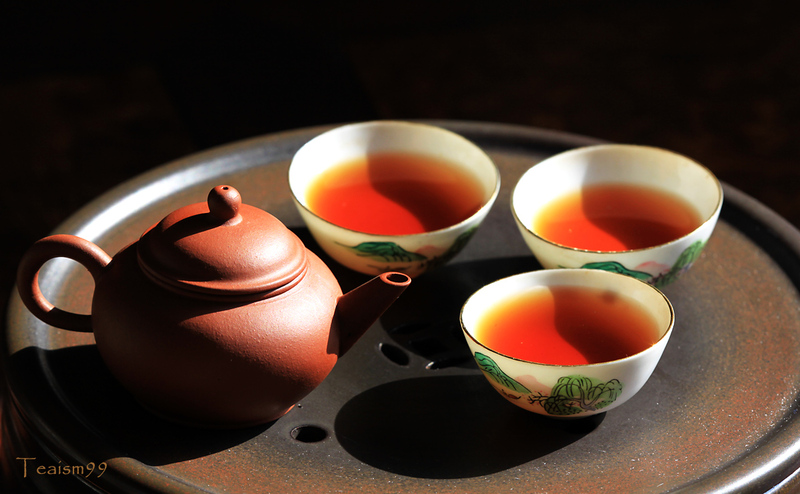 The tea is brewed in Chaozhou style so that I can exercise some control over its fragrance, sweetness and body. The verdict? Hmmm… a nice and exotic taste with a hint of more than 20 years of history imbued into the tea. The taste has the backbone of Yancha, no doubt, but has more vigour than loose aged Yancha. Perhaps it is because of the compression that allow it to age more graciously and slowly whilst retaining its flavour and vigour. I also enjoy the comforting mellowness which is typical to aged Yancha. A very interesting experience indeed. Perhaps this compression style should be experimented in other tea that can be aged. I would certainly would be interested in other tea like Semi Fermented Dong Ding, or Tie Kwan Yin, or red or yellow and and white tea done in this compression style. There are so much possiblities of exploring the compression style of aging other tea, beside Yancha and Puer. Chocolate Dong Ding, Chocolate Darjeeling, Chocolate Dian Hong, Chocolate Qimen, Chocolate Beidou etc…..Chocolate tea, anyone?